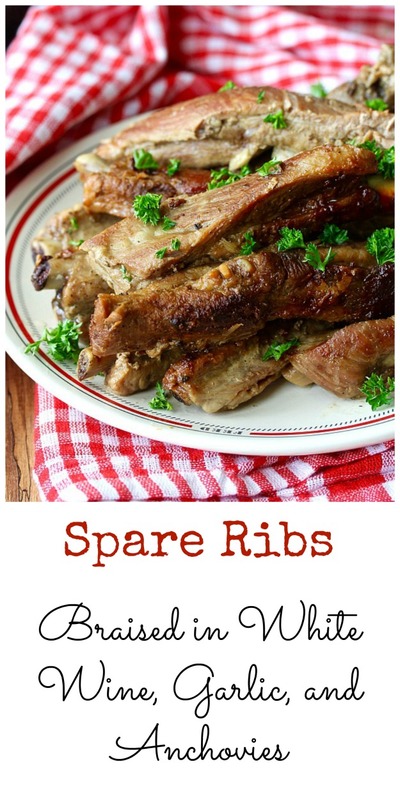 Using two large pots, I made a double batch of these braised spare ribs so we could have leftovers for my oldest grandson, who comes to our house after school every afternoon to do his homework. He's fourteen, growing like crazy, and loves ribs. He's usually ravenous after school. He loved these! This recipe is adapted from Kitchen Matrix: More than 700 Simple Recipes and Techniques to Mix and Match for Endless Possibilities. It's a collection of all of Mark Bittman's Matrix themed columns from the New York Times. This recipe is from the section, Pork Ribs +9 Ways. 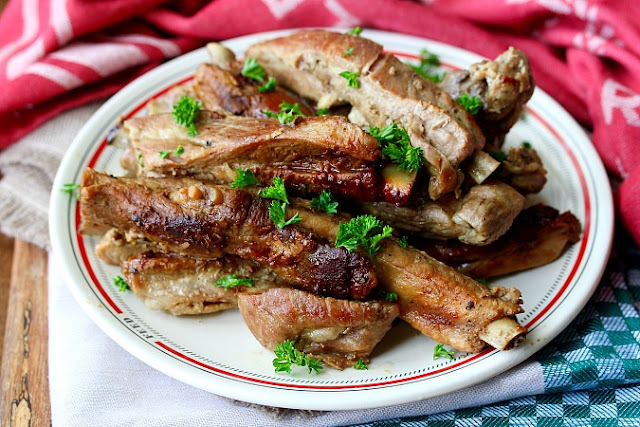 On just one page, there are delicious looking recipes for braised ribs, grilled ribs, and smoked and roasted ribs. I decided to try these braised ribs. Camilla of Culinary Adventures with Camilla is cooking her way through the book, with the help of Wendy of A Day in the Life on the Farm. Keep an eye on their blogs every Tuesday for a new post about the book. After the recipe are the participants' contributions this week. In a large Dutch oven, heat the olive oil over medium heat. Add the ribs, meatiest side down, sprinkle with salt and pepper, and brown for 5 to 10 minutes. Turn the ribs over and brown the other side. Add the garlic and anchovies and cook for one minute, stirring the ribs. Add the wine, and deglaze the bottom of the pan. Bring the pot to a simmer, cover, and cook over medium low, for about an hour. 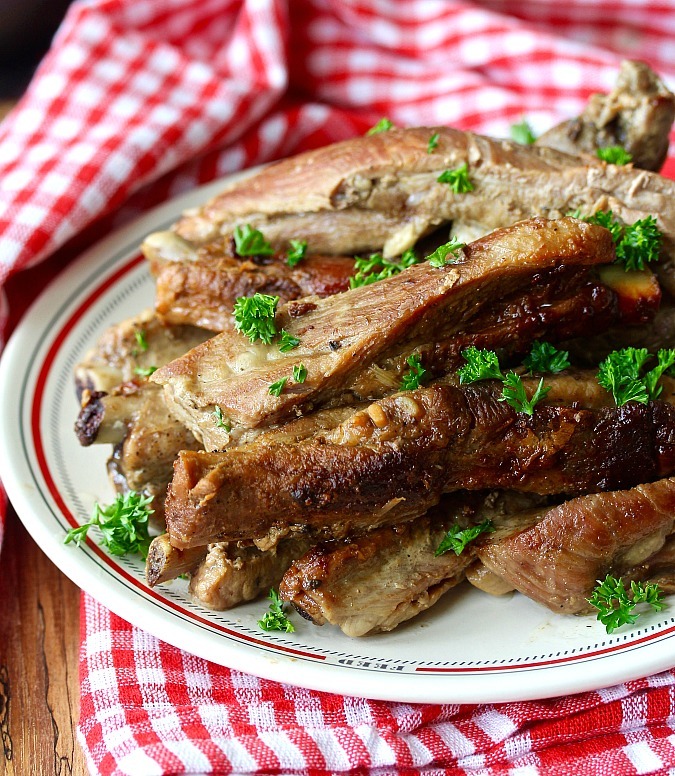 Serve the ribs garnished with the parsley. The sauce can be used over rice or as a dipping sauce for bread. We almost had 3 of the same recipe again. This was the first that caught my eye as well. We did didn't we! 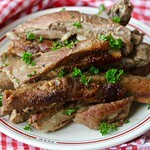 I really liked the idea of braising, a method I hadn't tried (although I've made them in the slow cooker. Those look fabulous, Karen. I should have done a double batch, too!! Thanks for joining us. Thank you. I'm so glad I did! I know a husband who would swoon for these!